Generations of my family have enjoyed growing African violets. These beautiful houseplants bloom all year and are easy to maintain. 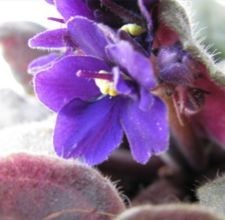 The most common cause of death of an African violet plant is the result of improper watering, yet this is easy to correct. Three watering methods will be described; use one you like and you will never again kill an African violet by the way you hydrate this lovely plant. Prepare the water for your African violet. Fill your watering can with tap water and let it sit overnight or-better yet-for several days so that the chlorine and fluoride it contains can dissipate. An African violet thrives with water that is room temperature or a bit warmer, and that is chlorine- and fluoride-free, yet contains the minerals and other trace nutrients found in tap water. Test the soil of your African violet. Push your finger below the surface of the soil. How does it feel? If the soil is moist, no water is needed. Wait a day or two and check again. Does it feel only slightly damp? Prepare to water. If the soil is bone dry, you have waited too long and have stressed the African violet-water immediately! You may water your African violet from the top. The watering can’s narrow spout can slip between the leaves and deliver water to the soil without wetting the plant. If there are white spots on the leaves of your African violet, they were caused by cold water and carelessness when watering from the top. You may get the leaves wet with room temperature water, but dry them with a paper towel before exposing them to bright light or they will develop brown spots. After 20 to 30 minutes, check the saucer under the pot, and drain any water that was not absorbed by the African violet. Standing water causes the soil to become saturated; the result is that the African violet suffocates because its access to oxygen in the soil has been blocked. You may water your African violet from the bottom. Put water in the saucer which is under the African violet’s pot and let it stay there for up to 30 minutes (replenishing if needed). After that time, discard any water that remains so that the soil does not become saturated. This is the method I use. You may wick water into your African violet from the bottom. This method must be set up when the plant is potted: insert a wick through the lower drainage hole and trace the inner circumference of the bottom of the African violet pot. Pot the plant, and place it over-but not in-a source of water, i.e. a tray whose floor has been covered with small stones. Only the wick should be submerged. See the first Tip for how to water a tray of African violets. Instead of individual saucers, multiple African violet pots can be set directly into a tray whose floor has been covered with small stones. All plants can be watered at once. After 30 minutes, use a turkey baster or dry towel to draw off excess water which is above the level of the stones. Leaving some water below the height of the stones will add desired humidity to the immediate environment. Water your African violet only in the morning or early afternoon. The plant will have enough time to absorb and use the water before its less active evening hours and nightly resting phase begins, and root rot will be avoided. As you become more familiar with your plants, you will know when one needs water by its weight when you pick up the pot, but you can always be sure by testing the soil with your finger. If you don’t have a suitable watering can, use a small baster or plastic medicine "syringe" to gently-and carefully-add water, so that you avoid watering the leaves. Save whatever water is left over to use another time. One African violet will not need at once all of the water that you have put into the watering can! Avoid using distilled water because it has no minerals or nutrients. Use only room temperature or slightly tepid water. Water slowly to avoid spills. If necessary, set a timer to remind you to check for and discard any excess water. If your home has soft water, do not use tap water for your African violets: the extra sodium contained in soft water is enough to kill them. Check whether there is a faucet (inside or outside) that does not dispense soft water. If you can’t find any untreated water, use bottled water.